Transgenic mice expressing green fluorescent protein (GFP) are useful in transplantation experiments. When we used ubiquitin‐GFP (UBC‐GFP) transgenic mice to study the availability of niches for transplanted hematopoietic stem and progenitor cells, the results were strikingly different from the corresponding experiments that used congenic mice polymorphic in the CD45 antigen. Analysis of these unexpected results revealed that the hematopoiesis of UBC‐GFP mice was outcompeted by the hematopoiesis of wild‐type (WT) mice. Importantly, UBC‐GFP mice engrafted the transplanted bone marrow of WT mice without conditioning. There was a significant bias toward lymphopoiesis in the WT branch of chimeric UBC‐GFP/WT hematopoiesis. A fraction of immature Sca‐1+ cells in the spleen of UBC‐GFP mice expressed GFP at a very high level. The chimeric hematopoiesis was stable in the long term and also after transplantation to secondary recipient mice. 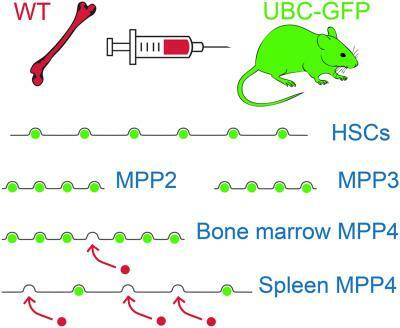 The article thus identifies a specific defect in the hematopoiesis of UBC‐GFP transgenic mice that compromises the lymphoid‐primed hematopoietic stem cells in the bone marrow and spleen. FALTUSOVÁ, Kateřina - SZIKSZAI, Katarína - MOLÍK, Martin - LINHARTOVÁ, Jana - PÁRAL, Petr - ŠEFC, Luděk - SAVVULIDI, Filipp Georgievič - NEČAS, Emanuel (K). Stem Cell Defect in Ubiquitin-Green Fluorescent Protein Mice Facilitates Engraftment of Lymphoid-Primed Hematopoietic Stem Cells.